Alegría and Georgina had a wonderful afternoon ice skating at Craigieburn Central where they have set up a temporary Ice Rink in the outdoor area between the Big W and Target quadrants. The rink is themed with Disney’s Frozen character cut-outs and music to skate and sing along to. 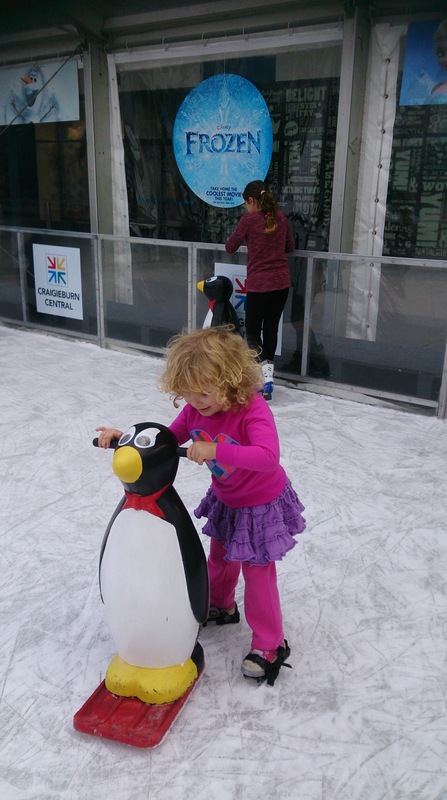 There are penguin stabilisers that the children can hold onto and skate behind and friendly staff available to help out. Alegria wore her own shoes with double blade clip-on skates and Georgina hired single blade boots. The hire cost was included in the low entry price. Alegría enjoying the penguin stabilisers whilst she finds her balance! The ice rink will be there until Sunday 14 September 2014 and if you like the Craigieburn Central Facebook page they are running competitions and giveaways! I love Frozen. I haven’t been ice skating before and it was fun! I held onto the penguin and Mumma’s hand and went around. It was cold and the ice was slippery. I want to go again! A fun, inexpensive activity! The rink is definitely more suited to pre-school and primary aged children as its small. I loved watching Alegría gain confidence and begin to ‘dance’ on the ice without the use of the penguin or my hand. I may or may not have been heard singing “Let it go” along with the Frozen soundtrack.